Material economy was a concern from the onset of this project. With frequent iterations and review, each piece grew in its complexity and sensitivity. What began as a "stressed skin" design evolved into a continuous extruded form utilizing alternating courses of the same profile to achieve a solid, structural core. Over 800 pieces of laser cut recycled card board were laminated together using precut holes to register the dowel rods. The final concern was of finish. 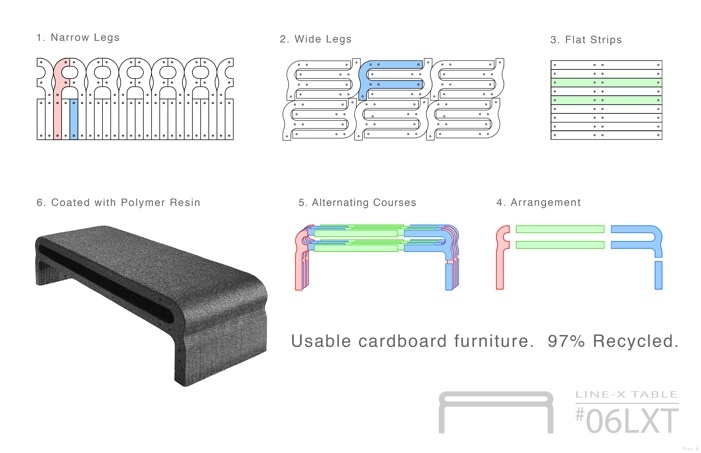 While many other designers have chosen to leave the cardboard bare, I was seeking to improve upon the usability of cardboard furniture. One possibility was skinning it in vinyl upholstery with stainless steel end caps. However, a moment of inspiration during a group discussion introduced truck bed liner spray. An inquiry was made to Line-X of Salem, VA and they agreed to coat a few prototypes pro bono. Over 3 years later, this rugged coffee table still sees active service. Durable, easily washed, and with convenient recesses for magazines and remotes- this coffee table has proven both its form and its process to be an intriguing addition to any modern living room.